A portrait of America's most famous racing yacht America, after which the America's cup is named. She was built at William H. Brown's yard along the East River in New York in 1851. Mr. brown built this yacht on speculation for a syndicate of New York Yacht Club members headed by George Schuyler. If sailing trials determined that the new boat was not faster than any vessel in the United States brought to compete with her, the syndicate was under no obligation to accept her! The vessel, designed by George Steers, lived up to their expectations. George designed America with his newly invented "hollow bow," which proved to be one of his greatest design innovations. America was launched as a schooner (smilar to a 'pilot schooner' - 95 ft length on deck, 23 ft beam, and drawing 11 ft. The original 1851 schooner is is carefully etched on the front side of this lovely tooth, and has some light color added. In 1885 her keel was redesigned to carry more ballast, and her rigging was lengthened to carry more sail. In 1887 she was painted white. 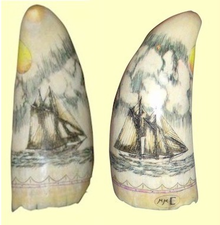 She is shown on the reverse side of this tooth painted white and with the re-rigging completed. This tooth is scrimshwed all around, and, although each side is complete within itself, the setting sun unites the two faces of America. A wave-like border surrounds the tooth at the bottom. This classic American Sperm Whale's Tooth measures 5 1/4 inches around the convex side from tip-to-base, is 2 inches wide at its base, and shows wonderfully graceful curvature. It weighs 158 grams. (Please click on pictures to enlarge.) A beautiful American ship's portrait by a respected American scrimshander - A great gift for any discriminating collector. Includes a beautiful hand-turned walnut display stand. Or choose to have us design and handmake a matching Sterling Silver stand as an additional option. Both stands allow for removal and replacement of the tooth for ease of viewing. Of course, as with all of our teeth, this tooth comes with a Certificate of Authenticity.